This thesis involves studies on the integral value of new advanced genomic testing techniques in fetuses presenting congenital abnormalities on prenatal ultrasound. 1. To evaluate the additional value of invasive single nucleotide polymorphism array over conventional invasive karyotyping or current non-invasive next generation sequencing based testing in specific fetal anomalies detected by ultrasound. 2. 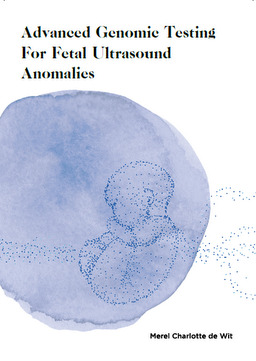 To evaluate the potential additional value of invasive fetal whole exome sequencing in specific fetal anomalies detected by ultrasound. 3. To provide an ethical deliberation on the offer of invasive testing for fetal whole exome sequencing in case of fetal anomalies detected by ultrasound.